Award-winning Chef and Restaurateur David Burke, talks about his new restaurant, David Burke Fromagerie in Rumson, New Jersey, and shares some delectable recipes. David Burke is not someone to let any grass grow under his feet. 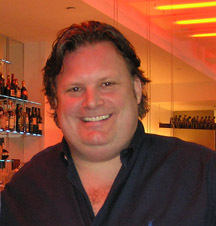 His titles include chef, restaurateur, entrepreneur, author, and inventor. He opened his first highly-acclaimed restaurant, davidburke & donatella in New York on December 23, 2003, David Burke at Bloomingdale's in New York in December 2005, David Burke's Primehouse in Chicago in March 2006, and David Burke Fromagerie, a fine dining restaurant in May 2006. Most people would be boggled by the activity, not so with David, who also found time to write two cookbooks, Cooking with David Burke of the Park Avenue Café written with Carmel Berman Reingold (1995), and David Burke's New American Classics written with Judith Choate (2006), and create and launch David Burke Flavor Sprays in August 2005. David describes his new restaurant, David Burke Fromagerie, as his baby. He literally grew up at the Fromagerie, which was the legendary #1 French restaurant in New Jersey. He worked at the restaurant as a teenager where the owners taught him how to cook in the early days, before he graduated from the Culinary Institute of America (CIA) in New York. When the owners decided to sell the restaurant after 35 years, David had to purchase it. He is a passionate, energetic person whose creativity runs from all things culinary to blowing glass, which he would love to do when he retires, but don't look for that anytime soon. In the meantime, he enjoys creating new recipes, collecting art, and spending time with his children. When I asked him "what's next?" He replied, "I don't know what's next, but the opportunities are there." Then he remembered that he has another restaurant opening in Las Vegas at the Venetian in December 2006, would like to teach cooking classes for amateurs, and teach professionals how to become good restaurant chefs. After an hour with David, I was both exhausted and exhilarated, by his passion. David graciously shares his innovative recipes from David Burke Fromagerie for Tuna Steak au Moutarde with Miso Vinaigrette and Shiitake Dumplings, and Poached Rack of Lamb with Fleur de Sel, Tomato Couscous, and Garlic Pearls. Preheat the oven to 250° F (122 ° C). Line a baking sheet with parchment paper and set aside. Combine the panko and mustard seeds with 2 tablespoons of salt in a shallow bowl. Place the flour in another shallow bowl. Make a seasoned egg wash by whisking the egg whites, Dijon mustard, and ¼ teaspoon salt together in another shallow bowl. Using a pastry brush, lightly coat the nori sheets with just enough water to soften them. Wrap each tuna log with a piece of nori and trim the ends to make an even fit. Place the tuna logs into the flour, turning to coat all sides. Shake off any excess. Then, roll the logs in the seasoned egg wash, allowing the excess to drip off. Roll each log in the panko crust. Heat 3 tablespoons of oil in a medium sauté pan over medium-high heat until it begins to smoke. Working with two tuna logs at a time, place the tuna in the hot oil and sear it, turning the tuna every 22 seconds, for about 8 minutes, or until all sides are nicely crusted. As the tuna is cooked, place the logs on the prepared baking sheet and into the preheated oven with door ajar, to just keep the tuna warm while you continue to crust the remaining logs. Heat the miso vinaigrette in a medium saucepan over medium heat. Add the dumplings and bring the mixture to a simmer. Remove it from the heat. Cut the tuna logs crosswise into ¼ inch thick slices, keeping each log together. Fan out a tuna log onto the left of, preferably, an oval plate. Place two dumplings in each of six bowls and ladle miso vinaigrette over them. Place each bowl on the right side of a plate. Sprinkle the scallions in the vinaigrette and the sesame seeds over the tuna. Serve immediately. Place the tomato juice, tomato fondue, miso paste, tarragon, and ginger in the bowl of a food processor fitted with the metal blade. Process the mixture to a smooth puree. With the motor running, slowly add the vinegar, soy sauce, peanut oil, mustard oil, and honey, processing it until well blended. Pour the contents into a non-reactive container and store it, covered and refrigerated, until you are ready to use it. Heat the oil in a medium saucepan over medium heat. Add the onion and garlic and allow them to sweat, stirring frequently, for about 10 minutes, or until translucent. Add the tomato puree and 1/2 of the basil and bring the mixture to a simmer. Immediately lower the heat and cook it, at a low simmer, stirring frequently, for about 40 minutes, or until 90% of the moisture has evaporated. Add the remaining basil, stir, and season with salt and pepper to taste. Remove the pan from the heat and allow it to cool. Store the mixture, covered and refrigerated, for up to 5 days, or freeze it, tightly covered and labeled, for up to 3 months. Place the mushrooms in a mixing bowl. Drizzle the peanut oil over them and toss to coat. Preheat and oil the grill or preheat a stovetop grill. Place the mushrooms on the grill and grill them, turning once, for 2 minutes per side. Return them to the mixing bowl and add the soy-honey marinade. Cover and refrigerate the mixture for 12 hours or overnight. Drain the mushrooms through a fine sieve, discarding the liquid. Julienne the mushrooms. Add the cilantro, salt, ginger and sesame oil, and stir to combine. Add the cornstarch and beat until it is well incorporated into the mixture. Lay the wonton skins out in a single layer in a diamond shape. Place a small bowl of water nearby. Spoon about a tablespoon of the mushroom mixture into the center of each wonton skin. Using your fingertips, very lightly coat the edges with water and immediately fold the wontons in half to form a triangle. Wet the folded corners and bring them up and over slightly to make a little, bowl-shaped dumpling. Bring a large pot of salted water to a boil over high heat. Add the wontons and boil them for about 5 minutes, or until they float to the top. Using a slotted spoon, lift the wontons from the boiling water. Set them aside until you are ready to use them. Combine the water, onions, carrots, celery, tomato puree, and 6 tablespoons of the salt in a stockpot over high heat. Bring the mixture to a boil. Lower the heat and simmer for 10 minutes. Add the lamb and return to a simmer. Simmer for about 30 minutes, or until an instant-read thermometer inserted into the center reads 130° F (55° C). About 10 minutes before the lamb is done, prepare the vegetables. Heat the stock or water in a sauté pan over medium heat. Add the carrots and butter and bring to a simmer. Season to taste with salt and pepper and cook for about 4 minutes, or until the sauce has thickened slightly. Remove the vegetables from the heat and tent them lightly with aluminum foil to keep warm. Heat the oil in a sauté pan over high heat. Add the spinach and, using tongs, quickly toss the spinach, cooking until just wilted. Remove the spinach from the heat and season to taste with salt and pepper. Remove the lamb from the poaching liquid and generously season with fleur de sel. Cut each rack in half and interlock the bones between each half. Spoon equal portions of the couscous in the center of each of six dinner plates. Place an interlocked lamb rack over the couscous on each plate. Season the eye of each rack with some additional fleur de sel and black pepper. Place 3 carrots into the rib bones and drape some spinach over the top of them. Lay 4 confit garlic cloves on top of the spinach and serve. Heat the olive oil in a saucepan over medium heat. Add the onions and tomato, and sauté them for about 4 minutes, or just until the vegetables sweat their liquid but have not taken on any color. Stir in the garlic puree and when well blended, stir in the couscous. Remove from the heat. Combine the water and salt in another saucepan over high heat and bring it to a boil. Immediately pour the salted water over the couscous mixture. Return the couscous to medium-high heat and bring to a boil. Immediately remove the pan from the heat and cover it tightly. Allow the couscous to rest until all of the liquid has been absorbed. This should take no more than 20 minutes. Tightly covered, the couscous should stay quite hot for about 40 minutes. When ready to serve, uncover, add the tablespoon of stock and the butter, and toss to fluff. Taste and if necessary, adjust the seasoning with additional salt and pepper. Read about David Burke Fromagerie in the Restaurants section, and about David Burke Flavor Sprays in the Luxury Products section. 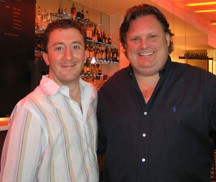 You might also like to read our article Restaurants - davidburke&donatella.